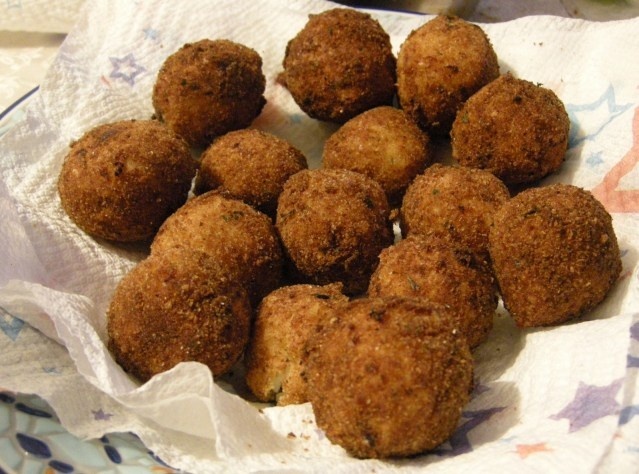 There are tons of recipes out there for arancini- some use peas (blech), some have a cube of cheese in the middle, but the common denominator is rice mixed with cheese and egg, then coated in more egg and crumbs and fried. I put out a yell for help on a Facebook group, and was given some great advice from Peter Battaglia, a food blogger. He makes lots of outstanding food, and it brings back tons of memories of food 'up the hill' at my grandmother's house. The trick to these is the rice. I used Carolina Long Grain White Rice, prepared as directed, made first thing yesterday morning. It has to be cooled. He uses pecorino, I had a 3 cheese blend this time around. He recommended saffron, but I did not have any on hand. Using a cookie scoop made quick work of forming them, roll through the egg, then the crumbs and then into a plate to wait their turn in the fryer. I went about ping pong ball size, and 3 were incredibly filling for a dinner portion. You could go smaller and do a pile as an appetizer, or go bigger, like the restaurant does and serve one. These were a huge hit for us. Jake loved them, and after watching us eat them with sauce, he asked for some on his plate too. VICTORY! The recipe makes A LOT. I am going to freeze any leftovers on a baking sheet and then move them to a ziploc bag. I'll reheat them in the oven. No plated pic, I was having a hard time with the light in the kitchen (even Tim jumped in and helped) but this is a pic as they sat on the towels draining. Will see if I can get one later of the interior. Combine rice, cheeses, yolks, bread crumbs, parsley, salt and pepper to taste. Chill for at least 1 hour. Roll into walnut size balls. Dip into egg whites, then roll in crumbs. Fry at 375 until golden brown, drain on paper towels. Serve with marinara and additonal sprinkle of cheese. "adapted from advice from P Battaglia"